My split 7″ with Mischief Brew, recorded all the way back in 2010, rescued and executed by our friends at Silver Sprocket Bicycle Club. 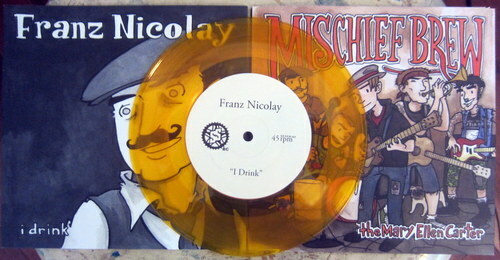 It’s got that good Mitch Clem art; and the first 220 are on blue vinyl, the rest on gold vinyl. Erik does “The Mary Ellen Carter” by Canadian folksinger Stan Rogers (with a little help from yours truly); and for those who liked Guignol & Mischief Brew Fight Dirty, yes, that’s Guignol backing me on “I Drink,” a deep cut from the great French-Armenian crooner Charles Aznavour. Digital download included.